Communication is the key to impart your sentiments, words and emotions. Your words can give someone a healing effect, you can bring smile on to the face of people just by your kind gestures and loving words. It is said anything and everything can be cured with love no matter how sick a person may grow, he will get better just by knowing there is someone beside to listen to him. It almost gives us peace of mind when we give vent to out pent-up feelings. So don’t hold up because, “Assumptions are the termites of relationships.” Never pile up your aggression, just spit it out, never hold grudges rather sort them out. Never breed hatred, just talk it out. And all this can only be done when we build our intra personal relationships through communication. “Much unhappiness has come into the world because of bewilderment and things left unsaid.” There are many chat applications and social apps that provide you a two-way channel. You simply have to log in, put your number, and add people, your relatives and friends to start talking nonstop through many audios, videos and also through text messages. Many social apps are adding up expressive chat stickers that say it all. These stickers give a shout out to what you are feeling. Some slangs like TTYL, TC, GN, OMG, LOL, YOLO, WTF are repeatedly and commonly used by all and sundry that even kids are aware the acronyms that the adults use in their conversations. 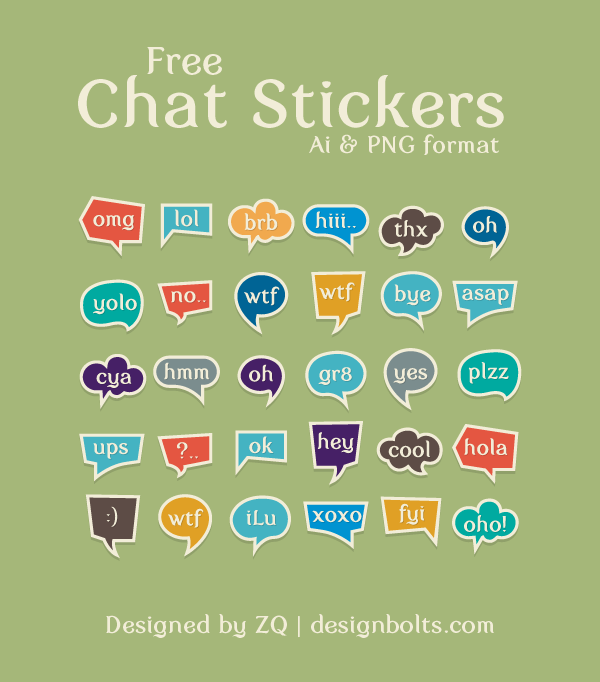 Now here I am providing you free chat stickers that are truly colorful, attractive and worth using. You can freely use them in the chat applications that you are designing currently or are liable to make in future. Have a look at these awesome stickers, start chatting it out, express your anger, desire, happiness, sorrow, joy, astonishment, compliments and more through these stickers. Stick around for more posts in future we are currently working on plenty of them to appease you and provide you greater design perspectives. Here we go!